News from the CTBTO Monitoring Station and its staff. 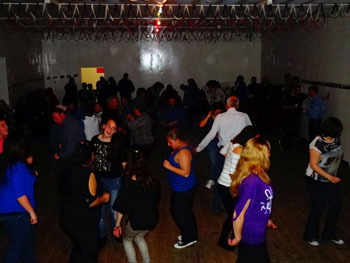 On Friday 23rd September Enviroearth held a celebration party at the Prince Philip Hall. 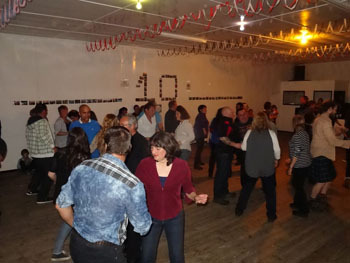 This was their 10th Anniversary of working on the island and the whole community was invited to the party. 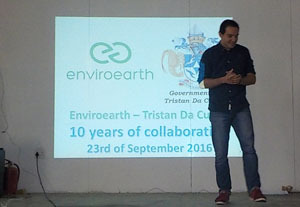 Former CTBTO Station Manager Marc Escudier gave a wonderful quirky speech telling all present about Enviroearth's work and the people involved, those working in France and on Tristan. Marc got all those present together for a group photo as his best friends were getting married on Saturday in France. The island community sends their best wishes to the lovely couple and wishes them all the best for the future. 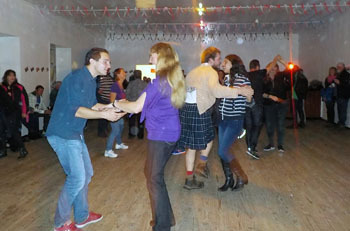 Later on in the evening there was dance which went on until early hours of the morning. 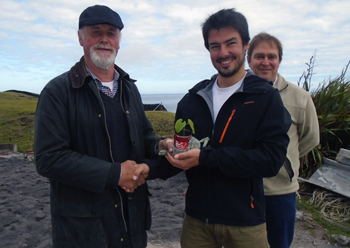 The photo left shows Mike Wolfenden presenting Hubert with a French Bean plant at the plant (as they say), with Chris Standing behind. See 2015 Development News to find out what this other plant is! Marc Escudier's last role as Enviroconsult's Tristan Station manager is to return to the island on SA Agulhas II in September 2015 to hand over and induct the new station manager Hubert Launay into the role. Hubert is very excited to be coming to Tristan. He is keen on outdoor activities and nature so Marc is sure he will enjoy the beauty of the island. 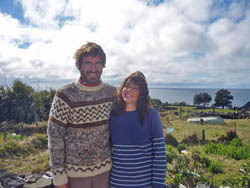 He spent a year working on Amsterdam Island, a French (uninhabited) remote overseas territory located in the Indian Ocean and is therefore used to remote places. Marc is sure he will be widely appreciated by the Tristanians he hopes he will enjoy his time on Tristan as much as him! 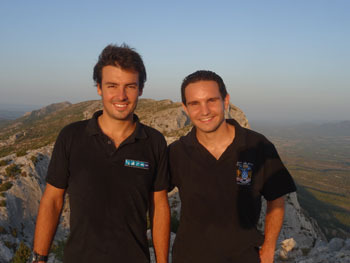 Euroconsultant's Hubert Launay (left) and Marc Escudier on the summit of "Sainte-Victoire", a mountain nearby Aix-en-Provence where the head office of Enviroconsult is situated. Tristan's CTBTO Station Manager Marc Escudier left Tristan for leave aboard the Hamburg Süd container ship Santa Ines which called at Tristan da Cunha on Saturday 28th June 2014. 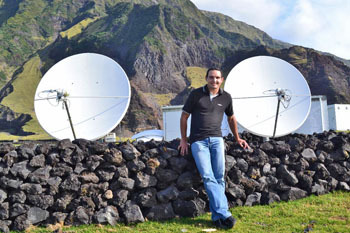 He plans to return to Tristan da Cunha aboard SA Agulhas II in September to become the first CTBTO Station Manager to serve a second contract on the island. 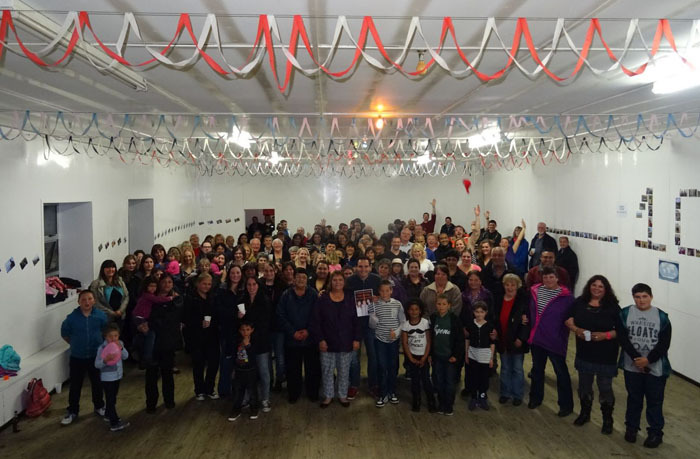 Dawn Repetto reports that Marc has gotten on very well with the community, young and old together and has made some good friends. People always have nice things to say about him and he is always visiting people with his lovely crepes if they are unwell or celebrating a birthday etc. 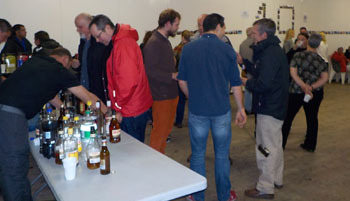 He celebrated a birthday and farewell party just before his departure. Marc has also been a regular contributor to the website so the Editor welcomes him returning for a second contract. Photo above shows Marc celebrating on Ratting Day! Marc Escudier took over from Maxime Le Maillot in 2013 to manage Tristan's CTBTO Station. Geoffroy Hienard arrived on SA Agulhas in September 2011 to take over from Thomas Lafaille. "I am 25 years old and my name is Geoffroy Hiernard. I work for the CTBTO, which is the Comprehensive Nuclear-Test Ban Treaty Organisation. The job of this organisation is to verify if any nuclear explosion occurs all over the world. 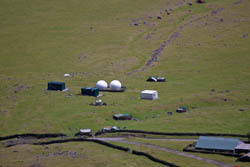 My job is to monitor a few stations on Tristan da Cunha, which is part of a big network of stations in the world, measuring radioactive particles and infrasound and seismic waves. Before working here, I travelled in South America, in particular in Peru where I lived for a year, studying earthquakes. I am a really curious person, interested in discovering all the beauty of our world and in preserving it. After a few months on Tristan, I really enjoy being and working here!" Frenchman Jeremy Peychaud arrived aboard SA Agulhas on 10th September 2009 to take over as the new CTBTO station manager from Leo Genin. This allowed nearly four weeks for Leo to induct Jeremy into the routines of the post. Jeremy is 23 and comes from a small village near Bourges in central France. He studied engineering in the French Alpine city of Grenoble and is already convinced he will enjoy his ten month sojourn on Tristan. 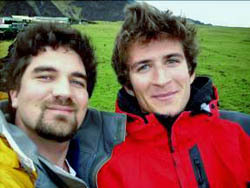 Jeremy sent this photograph of himself (left) with Leo taken in front of the station buildings. We look forward to receiving Jeremy's pictures and news during what we hope will be a happy stay on the island. 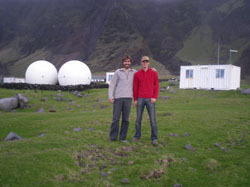 CTBTO Monitoring Station Manager Leo Genin and partner Emeline Dumouilla are pictured left outside their Gaetano Lodge (see Tristan Accommodation Page) home for the duration of their stay. They arrived aboard SA Agulhas on 12th September 2008 and are expected to stay until the middle of 2009. Leo follows previous French managers Thierry Assef, Jean Du Boullay and Clement Mochet (see pictures and notes below). UN Monitoring Station Manager Clement Mochet was given a farewell buffet party at The Residency on Friday 20th June 2007. 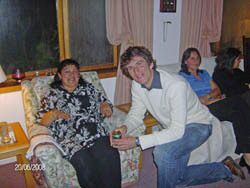 Left : Clement cutting his cake, which also marked his 24th Birthday, opposite him is Chief Islander Conrad Glass with other well-wishers looking on. David Morley reports that Clement has proved a popular figure on the island during his year on Tristan. He integrated well into the community and has added enormous value to life on Tristan by his willingness to help out in all sorts of areas (and weather). Clement gave valuable assistance to Ovenstone following the factory fire, and played an important part in helping to restore the island's power supply. 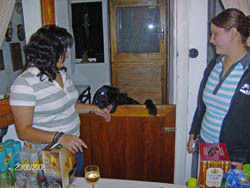 Left : Clement talking to Carlene Glass-Green with Joanne Green right. Clement also designed the project for the installation of a renewable energy power source at St Mary's School. 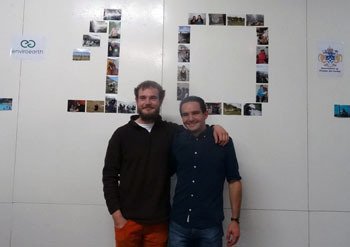 Clement departs with David Morley on the June / July Edinburgh voyage, and David hopes to meet with Clement in Cape Town to take this project forward. The period on the island is almost over for Jean Du Boullay, the French consultant managing the island station. 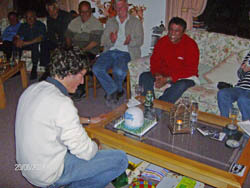 He arrived in the settlement on 24 April 2006 . 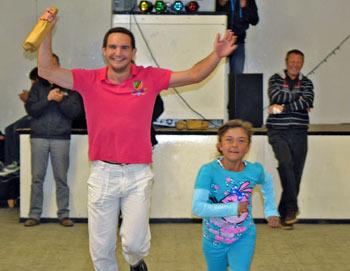 The new station manager, Clement Mochet, arrived with the Agulhas, and will stay until end of June 2008. Clement will be trained by his predecessor during the 3 week Agulhas stop-over. 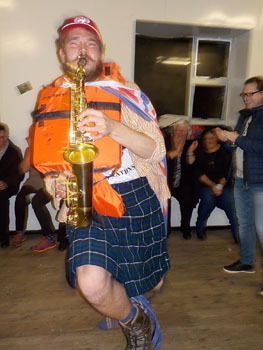 Aged 23, he has just finished his masters degree and considers this first position is a really unique experience. 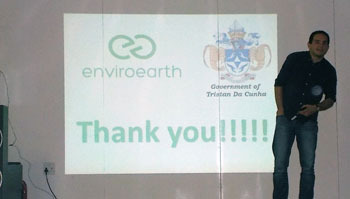 Despite a cold and rainy winter, Jean has been really pleased to visit the Island and to meet the Tristan community. He used to say “If you haven’t been to Tristan, you have been nowhere!” As a sailor, Jean intends to come back on the island with his own sailing ship in the next few years. Departing in June 2007 was Thierry Assef who worked as manager for the UN seismic station which monitors seismic activity, including earthquakes and nuclear tests. 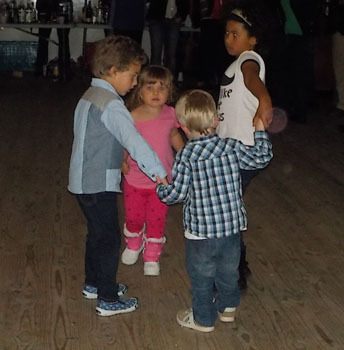 Thierry worked closely with Robin and Jerry Repetto and enjoyed his 9 months on the island. His photographs have appeared on tristandc.com and in the newsletter. Thierry reports that the islanders ‘..took really good care of me, sharing their best meat, fish and potatoes. I also had the real privilege to share their main events on the island, like fishing days, the break up day, sheep shearing, Queen's Day… even hunting bulls! 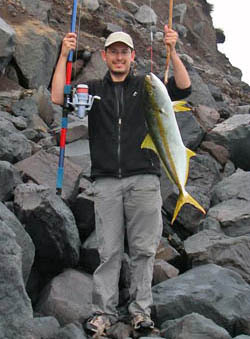 Photographs show left, Thierry with a Yellowtail after a spot of successful beach fishing and above Thierry's photograph of the UN Seismic Monitoring Station 'golf balls' and other buildings which were his responsibility during his sojourn on the Tristan station. 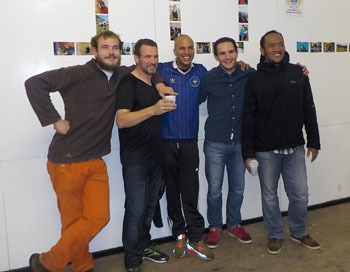 tristandc.com is very grateful to Thierry for many photographs received during his visit.